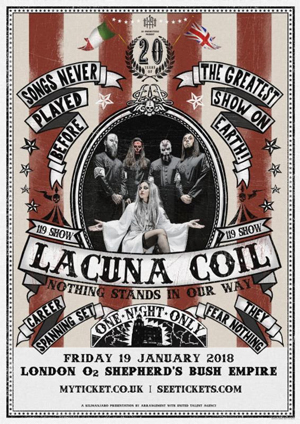 2018 will mark the 20th anniversary of LACUNA COIL's debut on the metal scene. To commemorate this special occasion, the iconic Gothic metal outfit are announcing a very special show. "We are very excited to celebrate our twentieth anniversary with an exclusive live show on January 19th in London! London is a very special city for us. It welcomed us with open arms when we started 20 years ago and we feel it's the perfect place to invite our fans from all over the world to celebrate with us. As for what will happen...that's a surprise. You'll have to come and see for yourselves!" LACUNA COIL are also working on their first ever book of the same title, Nothing Stands In Our Way, which will be published worldwide in 2018. Fans can go to http://lacunacoil.com/ for more info, including the option to register for early news and more. LACUNA COIL are currently on tour in North America as part of the "Ultimate Principle" Tour w/ EPICA, INSOMNIUM, and ELANTRIS. A complete list of remaining dates can be found below. 9.20 - Dallas, TX @ Gas Monkey Live! 9.27 - Baltimore, MD @ Ram's Head Live!